The patient’s previous dentist wanted to replace the front missing tooth with a treatment estimate of nine thousand dollars. This Cottonwood, AZ patient came to our office seeking a second opinion for a more economical solution to his failing front bridge, an alternative to an implant or bridge on the lower front teeth. Dr. Roy Daniels, a Sedona, AZ dentist was able to replace a missing front tooth for a fraction of the patient’s estimate from a dentist in Cottonwood, AZ. 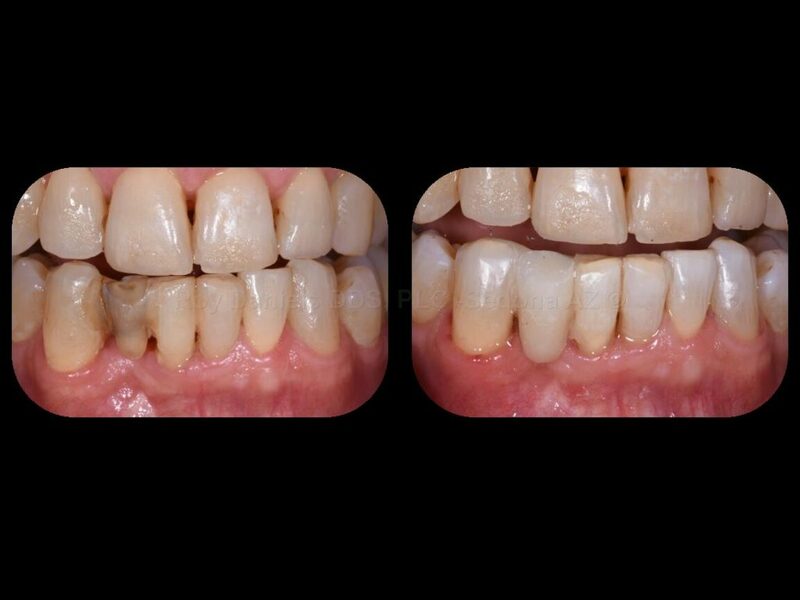 By utilizing a composite front bridge this non implant tooth replacement option fit this patient’s budget and looked better than when he walked in. If you are missing a front tooth or have a loose front tooth, call us today to discuss your treatment options. Another benefit is that the anchor teeth are kept in healthy condition and not compromised by grinding them down. Unlike laboratory made fixed bridges, if one of your anchor teeth becomes compromised, the bonded bridge can be removed and one of your natural teeth can remain unharmed. Cleaning around a bridge is not as easy as cleaning around a dental implant. In-between the teeth where the missing front tooth is bonded to its neighbors can attract an incredible amount of food and debris that must be cleaned several times daily, or the natural teeth can decay. The composite bridge is not as strong and may fracture if you have heavy biting forces. The bone under the bridge will thin over time and recede, causing the area to look unsightly or collect more food. This is a before and after photo of a low cost bonded bridge. This patient has a front missing tooth.